After the first confirmed outbreak of Xylella fastidiosa in the European Union (EU), associated with an olive disease denoted olive quick decline syndrome, mandatory surveys are now carried out in the member States and inspections increased at EU entry points such as ports. Such activities led to the interception of X. fastidiosa-infected coffee plants in consignments originating from Central America. Similarly, the geographic expansion of the olive decline epidemic area of the Apulia region (southern Italy) prompted investigations to identify new host plants. Here we report the interception of three novel bacterial sequence types in Italy, based on multi-locus sequence typing, that cluster with different X. fastidiosa subspecies, illustrating the risk of the introduction of additional pathogen genetic diversity into Europe. In the epidemic area of Apulia, new foci as well as host plant species positive with X. fastidiosa, including cherry, myrtleleaf and rosemary, were found to be all infected with the same sequence type of this bacterium (ST53, or CoDiRO strain). 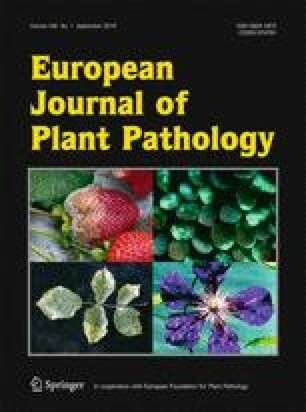 This work highlights the limited knowledge of X. fastidiosa phylogenetic and phenotypic diversity, the risk of novel X. fastidiosa introductions via contaminated plant material, and corroborates other studies indicating that the Apulia epidemic emerged from a single introduction of this pathogen into the region. This research was supported by grants from the Regional Plant Health Service of Apulia. We thank Alessandra Calzolari (Plant health Service Emilia Romagna, Italy), Valeria Gualandri (Fondazione Edmund Mach, S. Michele all’Adige (TN), Italy) and Anna Zelger (Provincia Autonoma di Bolzano − Alto Adige, Italy) for providing the coffee isolates. We thank Len Nunney for working with us on the new MLST alleles and STs. Work by RPPA was supported by the California Agriculture Experiment Station. Mention of trade names or commercial products in this publication is solely for the purpose of providing specific information and does not imply recommendation or endorsement by the authors. Almeida, R.P.P., & Nunney, L. (2015). How do plant diseases caused by Xylella fastidiosa emerge? Plant Disease, http://dx.doi.org/10.1094/PDIS-02-15-0159-FE.